The port city of Illikon was a thriving hub of trade and travel on the sea. Its renown dockyard was filled with ships from all parts of the known world, from exotic Southron baghlahs to mighty Imperial galleons. Their tall masts filled the air as sails caught the wind to carry ships in and out of the harbor. People scurried about the dockyard, striking deals, loading cargo, bartering, preparing to set sail. The smell of salty sea air clashed with the scents of foods and spices. To some, it was one of the wonders of the world. To the people of Illikon, it was Tuesday. While the majority of the fleets of the world quickly entered and exited the harbor, one ship sat apart at a smaller dock. It was an old looking ship, its weathered hull clearly showing its age and service. At a glance one could mistake it for a wreck that had been somehow left behind, or a ship waiting to be torn apart for spare parts. However, it was neither of those things. Worn as it was, one part seemed well maintained, in bright fresh paint was the name of the vessel: The Sun Chaser. To the rare few who stopped to read the name almost none would recognize the name nor the significance of the ship. However, the very few individuals who did immediately began to make their way to the Central District of the city. They knew who the ship belonged to, they knew the legends that it was made of. The one man who had owned that ship was nearly a myth, as he was so steeped in legend, rumor, and fame. When that moldy wreck was in Illikon, there was only one pub its captain would be in, The Silver Stein. However, for the common traveler, they would not have noticed or cared for a heap of trash floating on the water. Their goals varied, some sought adventure, others for coin, and a few to attempt to make their mark on history. Regardless of their objective, the best place to find men and women who could fulfill their dreams would be in one of the many taverns of Illikon. Rumor on the street was that the best offerings could be found in the Silver Stein, one of the largest inns in the city. It also helped that the prices tended to be cheap to help travelers drown their crushed dreams. The Silver Stein was noisy with the usual racket that made taverns unique. If one tried to decipher the din, right before they had a seizure, they would be treated to a three-man band cheerily playing away in a corner, drunken singing, conversations of all volumes, and shouting for more ale. Barmaids navigated the drunken crowds, serving drinks and food. Travelers of all manners sat together at long wooden tables, some at smaller tables around the edge of the room. The smell of stale ale and food mingled with the din that filled the air, keeping the stench of sweaty travelers at bay. At a lonely table in a dark corner sat two men. One was heavily bearded and drinking from a massive stein. His facial features were broad and muscular, more akin to a bulldog than a man. Above two busy eyebrows, he wore a large bandana that held long, wavy black hair out of his tanned face. His green eyes sparkled randomly with mischievous glints, hinting at a much younger man hiding within. The man was muttering to himself and humming along with the tunes being played, oblivious to the world, one hand on his stein and the other adjusting his well-worn coat. Sitting across from the human was a man that seemed to be in every way his opposite. He had thin features, attentive, sharp blue eyes, and short, straight blond hair. Two pointed ears stuck out form the sides of his head, clearly marking him an elf. He was sipping from a much smaller glass than his companion, the contents a more elegant drink. The elf was watching the room, his body tense as if he expected to be attacked at any moment. Every now and then he would spare a disdainful glance at his companion. “You should stop while you’re still conscious,” he remarked after a few moments. The man glanced up and grinned stupidly. The elf rolled his eyes. For a moment Wilhelm looked defeated as he shrugged and started to finish his drink to leave. Then his eyes suddenly came to life and a mischievous grin spread across his face. With a chuckle, he jumped up on the table, stein raised high. “Ladies and gentlemen!” he roared. The tavern noise died down as conversations stopped and all eyes turned towards him. With everyone’s attention, the drunkard continued. “I be Wilhelm of Illikon! Master of the high seas and mapper of the unknown! I be needing a crew to join me in me next expedition: To the edge of the world!” Wilhelm paused to take another swig. With a loud belch, he pounded his chest to clear his throat and spoke again. A silence followed. Wilhelm stared at the crowd as they started to turn back to their drinks and conversations. “Drinks on me!” he added with a roar, tossing a small purse across the room and landing in a very shocked looking bartender’s hand. The crowd cheered and immediately began ordering pints as the band struck up a lively tune. 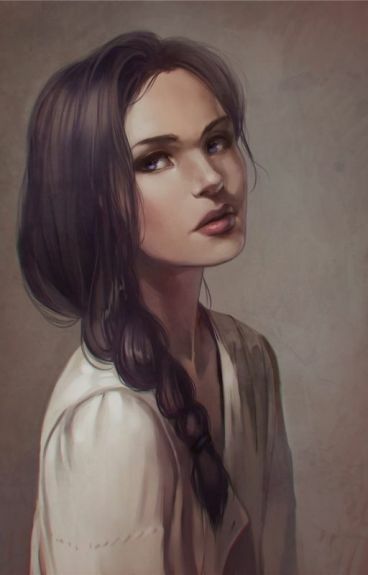 Grinning ear to ear, Wilhelm sat back down and looked back at Faelor. The elf’s eye was twitching. “Perhaps you forgot the sec-” Faelor began in a furious tone. Without waiting for a reply, the famous captain left. Faelor scowled and turned to face the growing queue of eager want to be adventurers. The first stepped forward. The elf sighed and produced a pen and quill. This roleplay is about an expedition set to find the edge of the world, and hopefully not fall off it. As such, I’m looking for characters that are seeking adventure, people who have nothing else left in life but to jump on a ship that could possibly be falling off the edge of the world. Try to keep the options somewhat plausible. Usual RP rules apply, I WILL be rolling dice for your characters so please be sure to get some stats that you’re happy with! Trinkets: Tends to have a satchel with quill and parchment to have ready a moment’s notice. 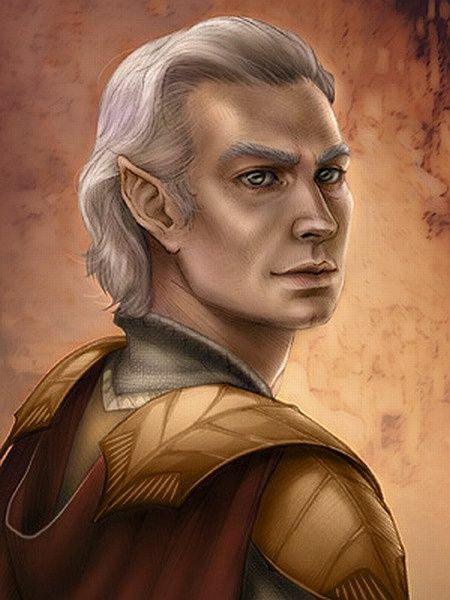 Faelor Ologolor was born as a purebred Sea-Elf. He was raised along the coast, constantly wandering with his parents in their jobs as fisherfolk and mappers. His father would sell their wares, while his mother would map the regions they went, marking areas with better chances of catching larger fish. They made a living from the sales and life seemed content. However, they decided Faelor needed more. They sent him off to Mimameidr to study and learn. Through some connections within the city, Faelor was accepted to learn. There he set himself on books like a fish to water. After a few years he had come to master many subjects, demonstrating great skill in memorization and drawing. For a Sea-Elf he had shown great promise to learn more and join the ranks of the loremasters. Though after years of study and promises of a life in comfort and learning, Faelor found himself yearning to return to the sea. His blood was tied to the ocean and he could not leave it. His new career happened during a visit to Illikon that he met with Wilhelm, back then a young fool-hardy explorer. The two struck it off as Wilhelm was in search of a first mate, someone who could help him. They traveled the world and faced many dangers, Faelor barely aging a day while Wilhelm shows how much time has passed in their travels. A warf orphan left to die in Antigis, Shauni's biological parents have long since deserted her to the fate of the Gods. If not for the saving graces of Wilhem and Faelor, she would have perished. 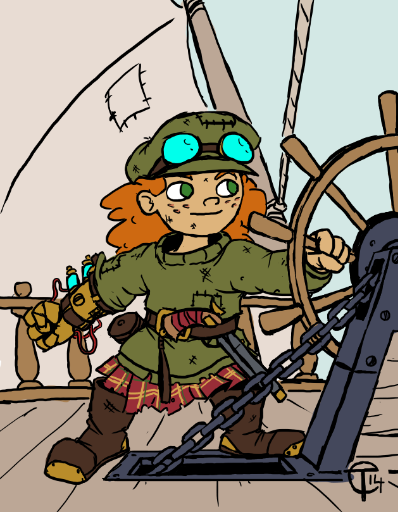 With the assistance of port wenches and the tutelage of her rough and tumble pirate family, Shauni has grown to be a rebellious youth destined for the seas. Though keen to Faelor's intelligence, Shauni has shaped up to be more than a handful under Wilhem's spirit. An improper diet has left her effectively malnourished in size, illiterate to all but sea charts and a delightful lexicon of sailor's curses that shock even the dirtiest of pirates. Her favorite games are of the gambling variety, often rigged in her favor. Her fingers are nimble enough to pickpocket, though she tries to never steal from her crew-family. Her clothes are baggy and oversized men's gear that do their part; Shauni has made her home in the crow's nest, though there are obvious nooks and crannies in the bowels of the ship that only a child could hide their loot within. 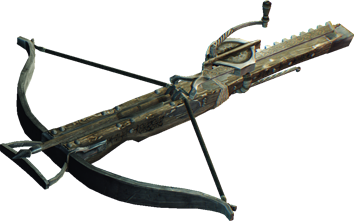 Weapon(s): Brackenburn primary uses a heavy duty, iron-wrought arbalest that can reliably puncture heavy armor and the walls of some peasant's homes. 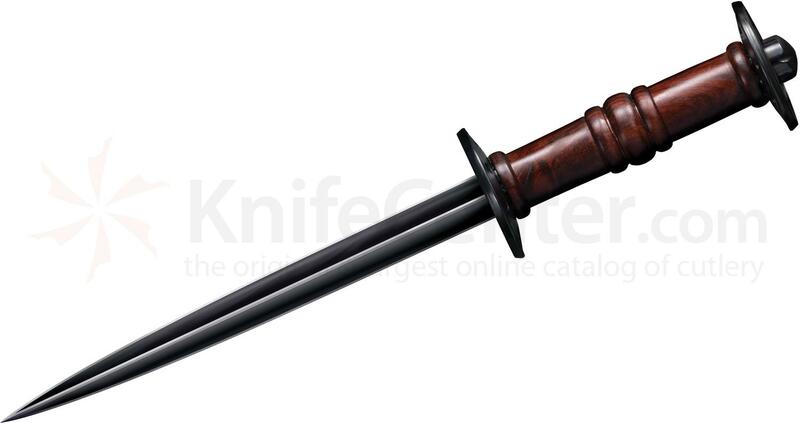 He's equally adept in combat up close with his new void-iron falchion, and, when all else fails, his rondel dagger. He also carries a plain black pavise that's smaller in size than most, allowing him to use it as a light-weight tower shield as well as a mount for his arbalest for longer engagements. Trinkets: Beside some basic equipment for upkeeping his weapons and equipment, none. Biography: Brackenburn is a mercenary with a morally dubious history. A veteran and deserter of a local army founded in Deltalund, Brackenburn has equal combat experience on sea and land as he spent several seasons deployed against sea-bound raiders. 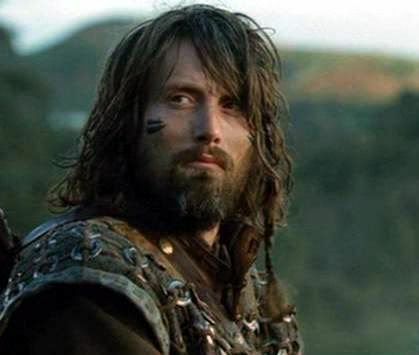 Bitter with the seasonal pittance that was his pay, Brackbenrun ultimately ended up deserting and joining a raider band as they retreated from yet another failed beach assault, as he realized that ransacking coastal towns and villages made more coin than defending them. 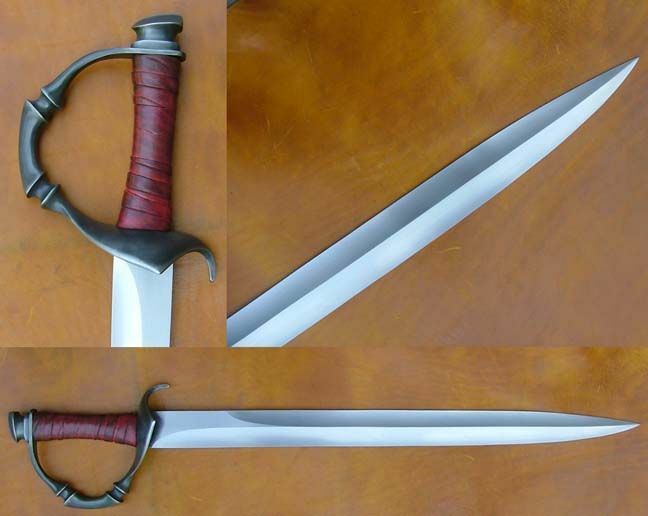 The soldier-turned-sellsword wouldn't find himself back on dry land several years later, as the raiders he was with eventually fell afoul of an awful coastal storm and ended up shipwrecked. Separated from what few others survived, Brackenburn found himself alone but not without his trade skills. Struggling out of the sand, the raider set out to the city of Illikon. It would be his base of operations for the next six years. Extortion enforcer. Bodyguard. Smuggler. Hitman. Bounty hunter. Merchant guard. Brackenburn has taken a variety of contracts that needed a bruiser who was good with a sword and crossbow, and managed to make quite a name for himself in the ports of both Illikon and Artorius. Of course, it was the kind of name people usually spit after saying, but it was a name nonetheless. But Brackenburn would eventually fall afoul of an enemy he couldn't overcome. The Inquisition. An agent had heard the man's name and approached Brackenburn with an offer he literally could not refuse, not if he ever wanted to see the light of day again. This agent of the Inquisition had been tracking down a refugee mage first sighted in Deltalund who had fled up along the coast from her hunter. The agent needed a local who knew the streets just as well as the underworld. Brackenburn took the job. Brackenburn won't say what happened. They'd cornered the mage, they'd gone in for the kill, but the mission got botched. Brackenburn was the only one seen leaving that building, clutching a void-iron falchion slick with blood, and with the Inquisitor left dead on the floor of the warehouse. He'd underestimated how quickly news would spread. It was hardly days later another agent arrived, this time with an entire posse of his own black-clad hunters. Brackenburn was running out of corners to hide in, past employers and gangs quickly throwing their hands in surrender as the Inquisition scoured the ports for him and the mage who was still at large. The mercenary was on his second to last holdout in the cellars of the Silver Stein, one of many many busy taverns in Illikon. He'd worked several smuggling jobs for the owner of the establishment who'd offered to hide him. But the wrath of the Inquisition was something even the most daring criminals didn't want to risk: Brackenburn had two nights to find his own way to escape an enemy that wasn't just in Illikon but lurked in all the civilized world. It was a dismal afternoon on the last day he'd be hidden in the tavern when he heard the explorer's call for men. An opportunity of escape had come at last. Edited by The Captain, 21 March 2017 - 01:25 PM. Appearance: While typically just about three inches tall, Basil does have the innate ability all pixies wield to grow to the height of a short elf - about five feet tall, in his case, specifically. Granted, with his rather weak constitution and the big targets his wings make him, he’s loathe to change from his tiny size: plus that lets him hide around Shauni easier. 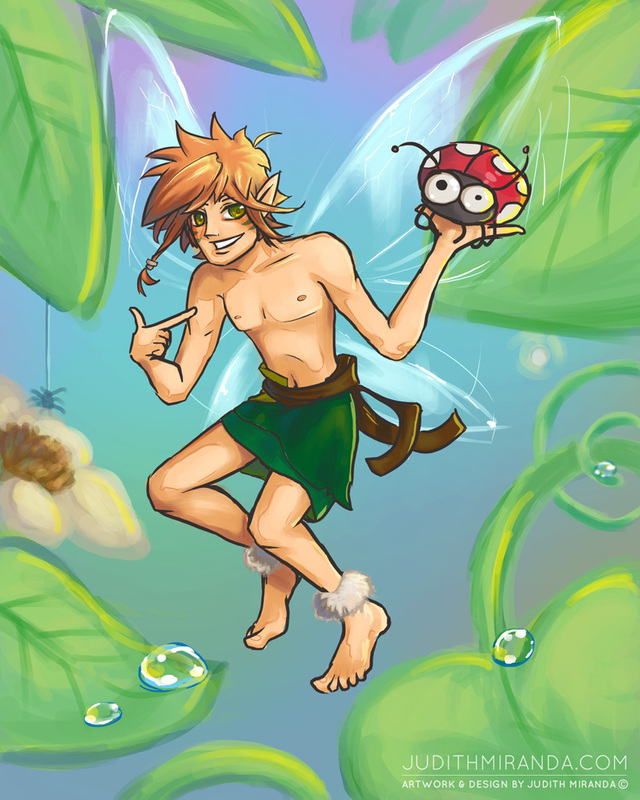 Deity: He has a casual disposition towards the spirits of nature. -He does carry a decent little bow, though it’s only worth much if he grows to a more full size. Trinkets: A whole sack of tiny baubles he’s collected from before and after meeting Shauni. He’s a sucker for shinies. Basil Shoreshimmer was born and raised to a small group of pixies living on a small tropical island off the west coast of Midgard’s main continent, not far from the Sunset Isles. Being uncharted to most humans, Basil grew up without fear of their kind and only surrounded by friends and peaceful nature, giving him a rather sheltered existence. When a ship of seemingly gargantuan proportions suddenly weighed anchor off the coast, however, Basil was overwhelmed by curiosity and a yearning to discover what it was and where it - and the enormous people aboard - came from. In his attempts to learn more, however, he ran right into Shauni, and he was soon a - at first - unwilling guest on the Sun Chaser as it set sail for the mainland once more. However, Basil soon grew used to her company, finding a kindred soul in the young human. He has stayed by her side throughout her adventures hence, though he’s tried to keep a low profile and out of sight of other crew members, content to be his ‘small’ friend’s secret. Aaaand I figured some kind of mage might be useful, especially one with some general arcane knowledge, charisma, and toughness. 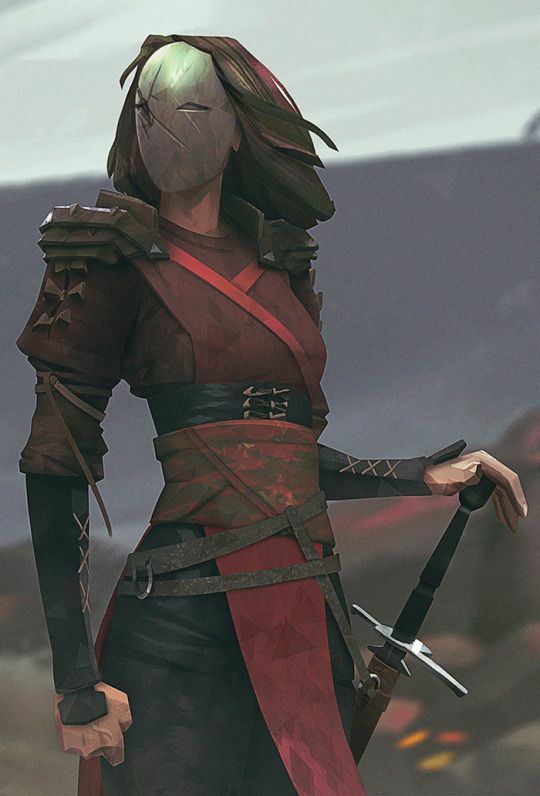 Appearance: While she does her damnedest to keep her face masked, underneath Tenebra appears to be a normal - if somewhat short and astonishingly attractive - woman. Seriously, even her attempts to make herself look more plain (and outright filthy at one point, out of sheer desperation) only seem to make men fall even harder for her, thus the mask. When her human disguise fails, however, Tenebra changes significantly thanks to the sins she was all but forced to commit. Ram-like horns sprout from the sides of her head, massive bat-like wings emerge from her back; a black, sinuous, spearheaded tail snakes out from the small of her back, her legs change shape ever-so-slightly to allow her feet to shift into goat-like hooves, and her nails grow into terrifying claws. In short, it’s difficult to tell her apart from a full-blooded succubus. Affinity: Light. The irony isn’t lost on her. Deity: None in particular. She refuses to worship demons, while worshipping the gods seems… both inappropriate and she feels she owes them nothing. -A simple-but-tough steel hand-and-a-half sword... which she hardly knows how to use, but it looks suitably intimidating. -A wickedly-serrated ceremonial dagger (of the sort that's engraved with mysterious runes and covered in gold filigree). Trinkets: A necklace bearing the symbol of her old masters. It has come in handy every now and then, even if it is a risk to carry such a tainted item. And her attempts to throw it away have always failed, the damned thing somehow returning one way or another. Tenebra figures it's enchanted somehow. Tenebra Abdris was the child of a Hidden One and the succubus he had summoned. Unfortunately for Tenebra, they had no intention of letting such a precious asset as a Gifted half-demon leave their hideout, and she found herself forced into the cult; indoctrinated as one of their own in the hopes of distorting her sense of right and wrong and guiding her into a pact with one of the demon lords of the underworld. At least, that had been the ultimate plan… one which, fortunately, Tenebra has avoided. For now. Despite the Hidden’s attempts to corrupt her whole self, Tenebra clung to her conscience with grim, unforeseeable determination. She was still forced into depraving circumstances and… eventually, Tenebra couldn’t help but begin to give in, starting to enjoy the lusting of others… and twisting it to her will through her physical… assets as well as her magical Gift; or Curse, rather, as she began to see it. The demon-kin’s will to fight her masters steadily withered even as her magical and demonic power grew. But, on the day she was meant to form her pact with Lillit, demon lady of lust, and properly join the Hidden as their own personal demon sorceress, Tenebra realized it was the perfect time to flee. The guards that were usually kept around her were summoned too late to halt her progress, allowing Tenebra to escape the underground lair she’d called home all of her life. Stepping out into the frozen wastes of Northrim, the demonkin had difficulty finding time to marvel at the surface world as she struggled to survive and disguise herself from the ever-hunting Hidden Ones. By sheer luck she ended up heading southward towards warming climes and more civilized lands, learning the difficulty of survival on her own the hard way. It was practically a miracle she made it to Illikon in one piece, and there she figured she was safe… if pressed to find some practice to live by. Despite Tenebra’s attempts to live by honest, wholesome means, her poor dwelling in the slums meant she saw ample amounts of sinful folk plying their trades day in and day out. The desire to control others and bathe in their lust steadily grew as she struggled with every other trade she could find and learn of, until finally the half-succubus was drawn into the trade her breed were practically made for. And then her luck ran out. In a matter of days the Hidden suddenly crept out of the woodwork - as they are wont to do - and struck. Tenebra scarcely survived her house suddenly and quite suspiciously catching fire, and spent the better part of a week living on the streets and trying to anticipate - and avoid - further attacks and ambushes. Through a mixture of wit, will to live, and knowledge of her enemy, Abdris has survived and happened to stumble into the Silver Stein in time to hear Wilhelm’s proposal. If there was one place the Hidden couldn’t possibly reach her, it was the edge of Midgard itself. Gender: Goddess, a rare subspecies of female. Though, if you asked her what the difference was between a man and a woman, she'd have a hard time explaining it to you. Race: Dragon, though most of the time she is disguised as a female human. Despite being from the East, Asuka has white hair and yellow eyes. She keeps her hair short because she hates how it blocks her vision in the heat of battle. 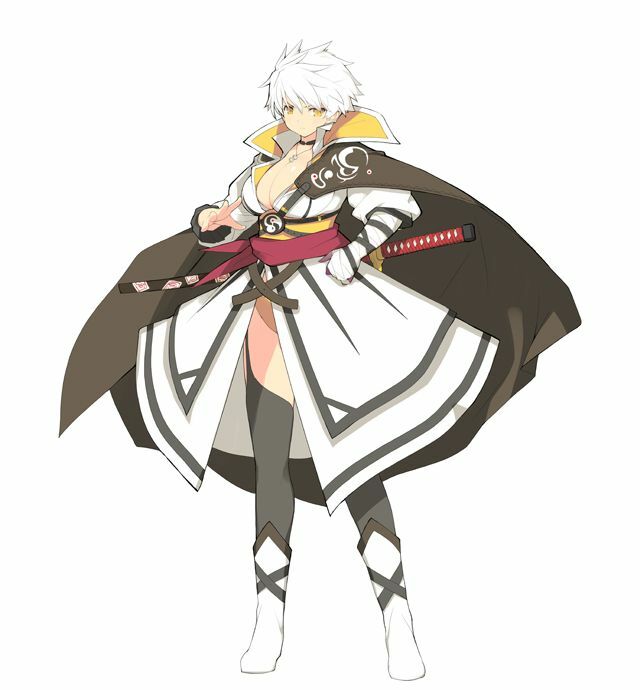 Typically, Asuka is seen wearing the outfit depicted above: a white robe and black cape that, unfortunately (or fortunately, depending on your perspective) does little to protect her body. Concepts like modesty are completely lost on her, and looking down on the other races for so long as a mighty dragon has caused her not to fear their puny weapons. Affinity: Lightning. Asuka claims to have once farted out a thunderstorm while in her dragon form, but nobody can verify her claim. Deity: Herself. Hurray for narcissism! Faction: The Army of the Legendary White Serpent. Yes, it is a totally real army and does not just consist of her (it isn't). Finesse Combat - While Asuka is not the goddess of swords she claims to be, centuries of training have left her skilled with a blade. This skill did not come naturally, as her first attempts to wield a blade were hilarious since she refused to interact with human trainers. However, being self-taught also had its advantages as Asuka's style is all her own, incorporating many swift movements that her enemies have a hard time keeping track of. She is also more than happy to fight dirty, viewing herself as the sort of god who wants people to do as she says, not as she does. As such, she will chastise her foes for behaving dishonorably before throwing dirt in their eyes. Hey, she's a god. She's above reproach. Arcane Gift - While most humans consider magic to be mysterious and awesome, for Asuka it is as commonplace as breathing. Given her affinity, Asuka specializes in lightning magic, be it hurling lightning bolts at people, charging her blade with electricity, or farting out a thunderstorm, Asuka can bring the pain. Survival - Most people can't stand to be around Asuka for more than ten minutes. As such, she was forced to learn to care for herself. She also cooks her own food by sneezing lightning onto it. Weapon(s): Asuka wields a katana with deadly efficiency. She'd heard all the criticisms before. "But katana's are bad weapons, wah wah wah." Asuka does not wield any ordinary katana: she has in her possession a legendary sword that was blessed by a goddess (a.k.a. herself). The laws of physics mean nothing to her! Trinkets: Asuka is writing her own holy book about her life and her many teachings. Currently, the book mostly just contains a list of the people she hates. You don't want to be added to the list. She also keeps a few of her favorite pearls with her (DON'T TOUCH). Nobody gave a crap. No, really. As impressive as Asuka was, she was always an introvert, much like most dragons, and preferred to spend most of her days arranging, rearranging, and taking stock of her pearl collection (which you ought to see). However, after centuries of confirming that every singly last pearl was indeed still there, Asuka experienced an emotion she had never felt before. Boredom. Gone were the days when legendary heroes were combing the countryside fighting dragons. Most mortals were perfectly content to leave Asuka alone seeing as she never bothered anyone and the only reward for slaying her would be some relatively worthless pearls. She always guessed that all of the true heroes were busy hunting dragons who hoarded gold. Lousy trends. She'd rather have a unique pile of pearls than another generic pile of gold any day. But alas, Asuka found that being a dragon was a dull life indeed. Dragons rarely even talked to one another. And so, Asuka decided to do something she had never attempted before: she would take on the guise of a human and enter their world. For years, she trained herself on the seemingly simple but surprising difficult art of acting and walking like a human. After falling on her face thousands of times, Asuka was finally ready to stand on her own two feet and enter the nearest town. Sure, the first time she walked into town she was chased away because she had forgotten clothes, but every screws up on their first try. The next time, after donning a samurai robe she had stolen after it was left out to dry, Asuka was able to enter the town without drawing much attention to herself. She even managed to attend one of the town's daily worship meetings for their deity. And it was there, as Asuka watched the people bow and give praise to whatever god they needed to thank today that she came to a conclusion: being a dragon was old hat, being a goddess was where it was at! Yet, that raised another question. How exactly does one become a goddess? She tried what seemed to be the most obvious thing and just went around telling people that she was a goddess and that they should praise her, but outside of one creepy guy who just stared at her, nobody ever attended her personal prayer meetings. Then she noticed that many of the mortals read about the gods and their teachings through books. A holy book, if you will. And so, Asuka the goddess came to her next conclusion: she would have to write a book with information about her and her teachings. Then people would worship her! Her first attempt at said book was a putrid failure. Not only did she realize that she had nothing to talk about besides her pearl collection (which was simply marvelous and you must-see it), but she also was forced to admit that she had no idea how to write at all. And so, Asuka used her greatest talent, one she had acquired after centuries of organizing her pearls: patience. For years, Asuka stalked the people of the town, doing her best to learn as much about them as possible. The people of the townsfolk often talked in hushed tones about the girl with white hair who just stared at them from outside their windows. Yet, despite being the town's local creeper, Asuka's plan was a success. She had mastered several important human skills like small talk (hey, do you like pearls), bathing (she originally licked herself clean like a cat before discovering how humans made baths), shopping (put the pearls in the bag of I'll stab you), and writing. Years of living on the fringe of human society had made Asuka a naturally good observer of people. She quickly learned what subtle mannerisms would get people to either stare at her (breathing in deeply and puffing out her chest always did wonders for reasons that were beyond her) or make them look away (such as looking at something off to the side that seemed really interesting). She incorporated her ability to misdirect people into her sword technique, either drawing people's eyes to her or away from her depending on the situation. At last, Asuka felt that she was ready to take on her next trial in becoming a goddess: she would travel the world, spreading her teachings and recording her travels until eventually the entire world worshiped her. And sure, maybe she did not have much to teach people outside of some of the many obscure facts she knew about pearls, but she was confident nonetheless. With sword held high, Asuka declared "Look out world. Here comes Asuka!" and off she went. And so, Asuka began to travel the globe in her quest to become a goddess. Unfortunately, her current number of followers was zero, but she was expecting that number to shoot right up. Regardless, Asuka draws attention wherever she goes as many aspects of the mortal realm are still lost on her. For instance, she had absolutely no filter and will say whatever she is thinking at the moment ("I gotta poop. Hope I don't start another thunderstorm. "), no sense of modesty (have you seen her outfit? ), and an odd desire to teach people about things she knows nothing about ("I'll tell you where babies come from little girl. They hatch from pearls!"). The worst part is that because she is a goddess she believes everything she says and is completely oblivious to how the world actually works. In her travels, Asuka eventually found herself in Illikon where a strange elf offered her a spot on his boat. Despite her horrible sea sickness, Asuka was determined to make the best of this opportunity and vowed that in a week's time everyone on this isolated boat would worship her as their true master. Let's see how this goes. Deity: Plutus, the Achaean god of wealth and prosperity. Gisburn was born as the only heir to the Noble Family of the same name in the Achaean City of Pikeston. His family were known for being great warriors, political schemers, and for their on-again-off-again feuds with the ruling family: the Vulpowiczes. His family was disappointed with him, as he chose to become a knight and fight for the empire, though that all changed when he received a crippling wound in combat against the Northerners. Gisburn had always hated his family for being the people who they were; crafty, sneaky, and all too focused on the political side of the Empire. However, with no other option than to live out his days as a beggar, he decided to become what he had once hated: a Politician. He eventually became so good at it, that his own family, fearing that he would betray them, set into motion a staged scandal that would end with his exile from the town. Faction: Whatever one his employer, Sir Gusburn, is currently joined up with. A Silver Necklace with a small figurine of Ullr attached. Biography: Loxley, real name unknown, was born in a small Northern town that was soon conquered and added to the number of Achaean Outposts in the North. His father, a proud man that had lost an arm fighting in the Empire, took out his anger at this out on his family, particularly Loxley, who always resented the crippled, husk of a glorious Northern Warrior. Soon after coming of age, Loxley murdered his father, but was soon arrested by the Empire and shipped off to fight in their Gladiatorial Pit-fights. At one such fight, his skill and aggression caught the eye of an Achaean Nobleman, one Sir Gisburn of Pikeston. After the matches were over for the day, Gisburn approached Loxley’s Keeper, and said that if the man could best him in combat, he would give him his freedom. Loxley accepted, believing that he could easily best an old, out-of-shape nobleman. However, when he actually fought the man, he was surprised to discover that Gisburn was still a capable warrior, and was defeated by him. Gisburn, not wanting to see one who had given him the best fight he had gotten in years waste away in the Arenas of the Empire, decided to buy his freedom anyway. However, there was a catch: Loxley was to be his Bodyguard and Business Partner in all of the nobleman’s future ventures. The two have worked together ever since, with Gusburn being the brains and Loxley the brawn of all of their adventures. Faelor paused from writing down the new crewmember’s name and peered over the desk. He was greeted with the familiar sight of his charge beaming with a giant grin. The elf smiled and set down his quill and shook his head. He paused and looked around the little human quizzically. “Is Basil with you?” The human nodded in response. Faelor seemed to relax slightly and waved for Shauni to hurry along. With a furrowed brown Faelor stared at the armored man that stood before him. The word “trouble” seemed to be printed all over every inch of him. Even better, he seemed to be in no position to ask questions or care about safe return. “Welcome aboard Mr. Brackenburn,” Faelor paused slightly after the name. His mind leapt back to a few wanted posters. He suddenly realized who the man was. A useful character to have, the elf thought. “We leave at dawn, you can stay on the ship tonight if you’d like a quiet place to rest.” The elf raised an eyebrow slightly and nodded towards the dockyard. Tenebra stood in front of the desk, her face concealed behind a mask. Faelor stared back with a bored-looking expression. He finally nodded and wrote the human’s (though he had his doubts) name on the growing list. Once finished he looked up at her again, squinting slightly as he tried to gauge her face. “Ship leaves at dawn, be there.” He said at long last. The next candidate Faelor found himself struggling to keep his eyes up. In his struggles to keep focused he found himself forgetting to pay attention to what the human was actually saying, all he caught was a name, and that she wanted to join. “Sounds good,” he started to write her name. The had to clarify the spelling about 4 more times before he got it right and let her know the details of their departure. Um. If you're going to be taking frustrations out on the group I'd rather not have that. Also I'm going to have to say no to two sign ups. I don't usually allow duo characters, Burgs is an exception as neither character is associated with each other and one is just a companion for another player. You can pick one of them to keep. For the signups themselves, I would question why the the knight would be wanting to join a suicidal mission to the edge of world. Given that nothing about it from Wilhelm's description sounds profitable. My other issue the rather contradictory statements within the bios. Gisburn is a knight of a family of great warriors but his family hate him? And there are some others. If you choose one character and clean up the contradictions it should be good! I do not mean to crap on your RP or something. I was pretty much guilty anyone who's in this RP and my RP to post. Abot Gisbrun and Loxley: I'm trying to be like that dirtbag mayor guy and his butler from Pocahontas, who pretty much came to America to find gold. Only, I'm trying to do it in Wulfgard. About Gisburn's Family: They used to be great warriors, but now they're known for being political scumbags. They hate him because that he used to be a warrior, and then when he did take up the family profession, he turned out to be better than them. I wouldn't worry about that man. You posted it, what, yesterday? Give it some time. Most rpers don't even have time to post until the weekend. Writing takes a lot of time and inspiration can be hard to find. Be patient. One thing that will not help your cause however is lamenting about how people have not posted. Relax, do something else, and if there is still little activity try switching things up. In the meantime, I give you the gift of wrestling. Still. Please don't do that in other RP topics. It's not cool. You can PM them or something. Ok. I can see that angle. Though do note, this announcement is taking place in a pub that is full of adventurers looking for work. Also your faction wouldn't be the Sun Chaser as only dedicated members of the crew (IE, Arby and Burgs who both precleared their characters and backgrounds) are part of the faction. A good example of faction and backgrounds would be Hawk and Captain. The faction section is in regard to your faction pre-Sun Chaser. Your character is essentially standing in front of Faelor, so your acceptance has not been determined yet. And that makes sense about his family, in the bio it wasn't explained clearly enough and led to some confusion. I still have to say no to both as the kind of characters looking to join would be people that are 1) In a pub that is frequented by adventurer-types looking for working and 2) Crazy enough to go on an adventure to the edge of the world. I recommend looking at some pirate-adventure movies for inspiration. Some examples would be a merchant who specializes in rare and exotic goods looking to find a new spice along the way. Or a genius outcast from his town for an accidental killing. An out-of-his-luck adventurer that wants to become super famous and make his mark on history by charting the edge of the world. So you would rather have me either create either a generic adventurer or a generic explorer/pirate? So far, you've accepted an actual child, a psychopathic mercenary, a fairy, a half-demon, and a dragon as characters. Why is it so inconceivable for a entrepreneur and his bodyguard to join this expedition? Is it just because they aren't exciting enough for you, or is it because I blatantly said that they would use this expedition to further their own careers? At the bottom of my post I put down some suggestions for alterations to Gisburn. I never said to make a generic character. In those classic pure adventure movies there are always great examples of characters that are not generic. I also said I am not accepting duos. So you need to pick one or the other. I would also like if you cleaned up the sign up like change the faction, and ensure the bio reads clearly as they are still some contradictions in it. Like somehow is a great warrior that even when out of shape is still good, also a great politican, and also good at buisness. There doesn't seem to be any flaws, he's just good at a lot of things. If you can pick 1 and clean up the signup then I could accept it. an actual child, a psychopathic mercenary, a fairy, a half-demon, and a dragon as characters. Which of those is the generic adventurer or generic explorer? Cause that sounds like an ensemble cast made for shenanigans. No one is saying make generic anything. Sir Gisburn could be perfectly retooled into a fitting character; I recommend working with the hindrances and flaws of a character first. A 'Guy' who is literally good at everything does not make for a character arc, nor does it provide an opportunity to mature into anything. You must remember that any character's story must be the most interesting portion of their life, or it isn't worth telling. Take the 'greediness' and 'hoping to exploit whatever natives he encounters and run with them; these are great flaws that will naturally bring conflict between characters, both crew and foreign. Also, what's the point of a bodyguard with borderline identical combat stats to his VIP? I just wanna say you should totally drop the bodyguard, give Guy whatever character flaw you like (He seems like he'd do well to be a completely self-serving, manipulative evil business-man type), balance out his conniving ability with his combat prowess, and boom you got a Governer Ratcliffe-type who can go around bribing different members of the cast to side with him and add to party shenanigans, especially once combat rolls around and peoples' priorities get skewed. And while it's definitely not implausible to be a skilled combatant and politician (I mean look at some great political leadesr of the ancient, medieval, and even modern world), he might be more in character as an entrepreneur/expert conman type who habitually gets run out of town once he's found out. That might give a better motive for fleeing to the possible end of the earth? But I mean I'm just tossing ideas around, I think your Guy character is already on the right track to being a fantastic cast member, just currently he seems a bit too much a bit of everything. Edited by The Captain, 23 March 2017 - 11:08 PM. I'd totally sign up for this (obviously), but I'm pretty much being massacred by my university and various other work and obligations right now, so I think I'll have to pass. Probably just slow y'all down, anyway. Have fun, though. Honestly, creating a more competent Governor Ratcliffe was the main goal of this character. Gisburn was born as the only heir to the Noble Family of the same name in the AchaeanCity of Pikeston. His family’s ancestors were known as great warriors, but nowadays they were known for being political schemers, as well as for their on-again-off-again feud with the ruling family: the Vulpowiczes. His family was disappointed with him, as he chose to become a knight and fight for the empire, though that all changed when he received a crippling wound in combat against the Northerners. Frustrated, Gisburn began to wander the Empire, conducting a number of business deals that ranged from entreaperuic to downright shady. His latest scheme ended with him being chased by a mob of angry peasants all the way to Illikon, and eventually joined the Crew of The Sun Chaser, in hopes of discovering new lands across the sea that he could exploit for his own profit, as well as escape from the large number of people who are hunting him. I'm hoping I've just jumped in in time! Appearance: Olive skinned and naturally beautiful, Adrienna generally wears a simple but attractive dress, or a fitted blouse with hardy trousers. She wears a silken scarf around her hair and another around her waist. Her lute is generally slung over her shoulder. Weapon(s): A short but razor sharp blade, worn concealed. Trinkets: A beautiful and ornate lute. Biography: Daughter of an Achaean duke, Adrienna was spoiled and pampered from an early age. Destined for marriage to secure a political alliance, she was expected to sit in the background while her elder brothers made their names, working on needlework and music lessons. This did not suit her cheeky and adventurous spirit in the slightest. Her father’s eyes were opened to this one summer afternoon, when he and his esteemed hunting party returned to the stable to find the young woman in a rather compromising position with the stable boy. Embarassed and enraged, the duke gave her a choice. Immediate marriage or disinheritance and exile. Adrienna gladly chose the latter. These days she survives singing and playing the lute in taverns and drifting from place to place, her goal to see the world and experience its many pleasures. She has picked up a few combat skills and.. Other methods in her travels. The edge of the world? How can she resist? Sorry about the delay, jetlag is a bugger. Faelor looked the man up and down, mentally noting everything he could immediately see about the man. The elf was a bit confused as to why a man of his caliber would join them on the quest. Granted the captain seemed to be taking all sorts aboard, he glanced to the side where the woman from the east was standing. The elf mentally shrugged and focused on the man standing in front of him. "There's hard work, but if you feel up to the task, welcome aboard." Faelor wrote the man's down and explained where the ship was and what time they would set sail. The young woman in front of Faelor was bubbling with energy, her appearance seemed to fit what most would think of a bard. Faelor noted with despair that in many ways, her energy felt similar to Wilhelm's. A small part of Faelor silently screamed as he considered the idea of 2 Wilhelm's (not counting Shauni who seemed to take on the eccentric captain's style). Before he could speak, however, another voice spoke up. "Welcome to our merry band!" Wilhelm continued. Faelor looked down the list and reread many of his little notes about each member of the new crew. He had seen worse and he had seen far, far better. However, beggars could not be choosers and with Wilhelm as the captain, they would take on most anything that was breathing. Except Maurice. Faelor shoved the disturbing memory aside and focused on the crew. They seemed worthy enough, he knew complaining would not yield any results and contented himself with an ale to drown his concerns. Welcome aboard everyone! I'll get the starting post up sometime tonight and we'll set sail! If anyone else wants to join in, just PM me and we'll work ya in with no problem! Appearance: An extremely tall old man clad in a cowled grey wolf skin and mail armor, Runi is broad and has lost not an ounce of his enormous musculature, despite his age. His white beard - streaked with black - is just long enough to braid, same with his hair, and his thick brow overshadows his sharp, incredibly bright blue eyes. In his youth, he was a truly handsome and savage warrior, and his features have aged well. Berserkergang (Wolf) - Long ago, Runi underwent the rituals of the berserkers, binding his soul to the spirit of the wolf. He trained extensively in the use of swords and axes, with which he is still extremely skilled. Even giving in to this rage slightly in the heat of battle provides Runi with an incredible edge to all his physical abilities - one that increases the more he gives in, though at great risk to himself. Some say werewolves are immortal, and rumors abound of what exactly becomes of a berserker's soul after it is bound to a beast... particularly the wolf. It does not seem that Runi is immortal - the idea seems preposterous, especially to him - but he has certainly aged well, better perhaps than an ordinary man. If he ever gave in to the rage he now always resists, it is likely he could wreak even more destruction than he did in his youth. Survival - Over the years, Runi has learned how to stay alive - and navigate - just using his own wits and whatever resources are available. Intimidation - Runi is not a man one can easily brush off, especially since he is also a man who looks like he could pick most anyone up by the neck and break it like a chicken... which he can. Enraging him is unwise, so most seek to avoid it. Herbalism - For all his talent for violence and rage, Runi has a keen taste for good food, and he certainly knows how to fix it. What's more, however, he knows many herbs, as well as how to make a great many potions and salves, some with... interesting capabilities. Weapon(s): His spiritual strength is his greatest weapon, capable of making his own body into a force to be reckoned with. 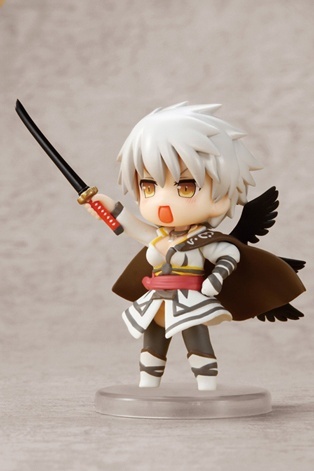 However, that can also be aided with tools, so he therefore carries a round shield on his back, a bow and arrows on his back, a knife in his boot, a dagger on his thigh, and an axe and sword on his belt. Runi is not one to be found without weapons, even knowing his strength without them. Biography: Known for his poor luck but great ferocity and wisdom, Runi is an enigmatic old ulfheðinn who generally keeps to himself. They say he was born to the Wulfings, but given that his last allegiance was to the Wurmtongues, this is little more than hearsay, especially since he never gives his name as anything more than "Runi." In his youth, Runi was a legendary berserker, slaying monsters and men alike. He was even brave - or perhaps stupid - enough to give in to his rage on the high seas during his time among vikings, endangering everyone near him. After a close encounter with his wolf spirit, however, Runi decided to stop altogether, before he truly became the monster that the tales of his exploits claimed him to be. After wandering Northrim, Runi ended up in the Northwestern Empire, receiving more than a few suspicious glares. Once, in Eloh, he was attacked by a superstitious mob who believed him to be a werewolf. Invigorated by this brief taste of battle, Runi headed west to Illikon, deciding that - perhaps - the time had come for another adventure. He may be old, but he has lost none of his edge.